Bo Sanchez sent out Volume 3, Issue 8 of the Truly Rich Club StocksUpdate Newsletter, and the headline reads: “We’re Champion Turtles” in reference to Bro. Bo’s recently launched “The Turtle Always Wins“, as well as the developments in the Philippine stock market. 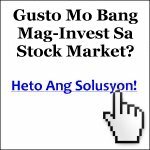 Bo Sanchez emailed us a Stocks Update SELL Alert last February 20, 2012.